NMS-Edit Professional | Innovative Technology Inc.
NMS-Edit Professional is a word processing editor designed exclusively for construction specifications. It allows customers to quickly reduce master specifications such as the National Master Specification (NMS) into project specifications with a minimum of effort. NMS-Edit has been available for the IBM PC family of computers since 1983. Architects, engineers, specification writers, building owners and government agencies across the country use and recommend NMS-Edit for construction specifications. By taking advantage of the graphical user interface of Windows and integrating project management features, this new version, called NMS-Edit Professional is easier to use than ever before. NMS-Edit Professional is designed to be simple enough that architects, engineers and specification writers can use it, reducing the amount of proof reading and extra checking needed. It has tools and features that make specification writing a dream. The editor supports sections numbered with 5, 6, 8, or 10 digits. 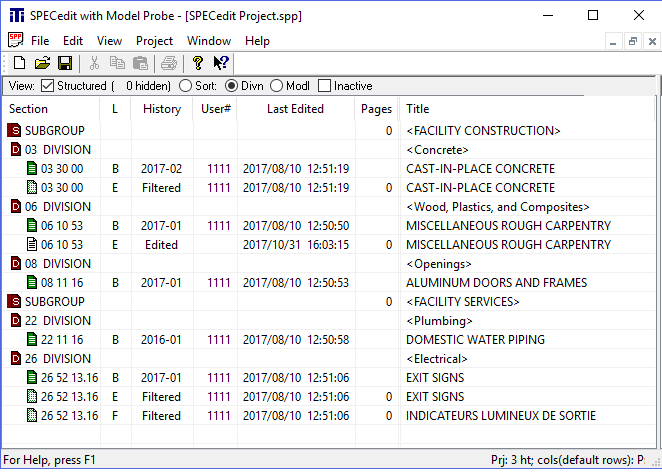 Copy text within a section or between sections in a project. Entire paragraphs or articles are easily copied. When sections are printed, paragraphs are not broken between pages and 2-column sections show the previous paragraph header at the top of each page. The project can be exported to multiple Word files with one command. Underlining and bolding for each exported type of title can be specified. Word files numbered according to SectionFormat™ numbering can be imported into the project and become identical in format to any other NMS section. Use the toolbar buttons for easy cleanup of your section. Master NMS and DDN files are never overwritten and remain in the project for future use on another job. Click on a standard number in the Section Viewer to be taken directly to the TechStreet standard. Paragraphs are automatically numbered on-the-fly, or set the numbering to be delayed until the section editing is complete. Pre-edit your new NMS masters to become a set of office masters for all to use. When a project is initialised, all section masters and edits are available for editing and reporting. A single file containing your complete project set means that you will not misplace individual sections, making printing and archiving the job easy. Build a list of contents for the project with proper page numbers and a drawing list with one command. The project manager will list all the standards referenced in the project, including user-defined ones. The project manager will warn you of standard numbers throughout the entire project that are out of date, with one command. The project manager will flag sections referenced in the project but missing from the project. 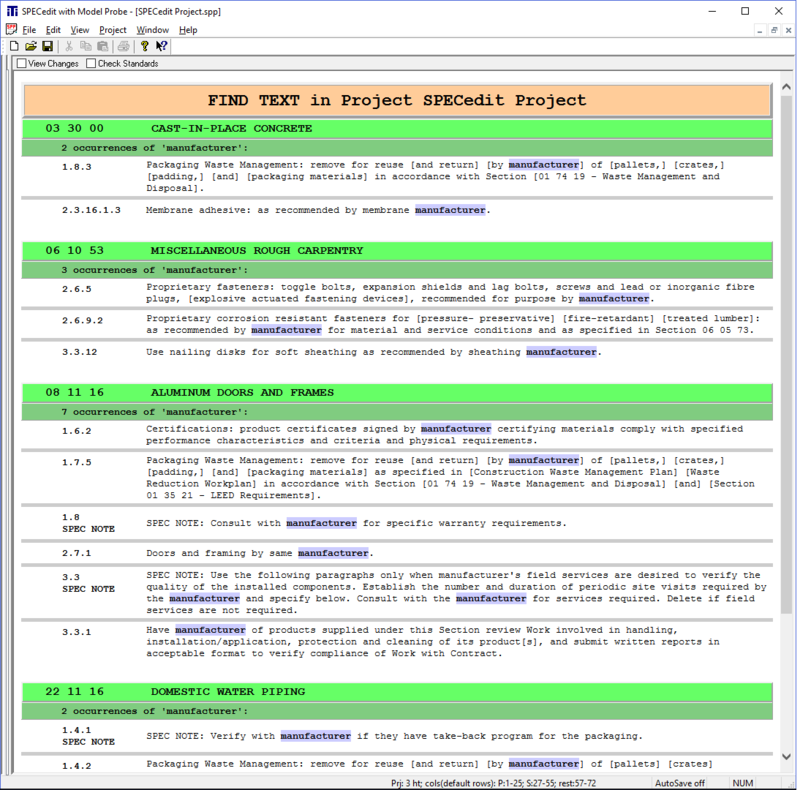 Font and layout (wide-page or 2-column) changes are made at the project level and automatically sent to each section. Change the Project Name, Publication Date or the size of all section headers with a single command. Up to eight sections may be edited at once, facilitating copy-and-paste. Find the help you need under the Help menu.